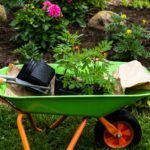 Just as many of us have a favorite pair of pants or a special way to fold towels, there are also preferred watering cans among the knowledgeable gardening set. Each option is as individual as those pants and provides a slightly different watering experience. Different types of watering cans can fulfill specific roles in the home and the landscape. Read on for an informative look at watering cans and their many varieties. Nozzles and necks. Who knew these were important items in the watering world? The many different types of watering cans encompass unique body styles but also different diameter and length necks and a host of handy nozzle designs. Each is fashioned for different plant needs. The style you choose depends upon the size of the plants as well as the method needed to deliver water. Some tips on when to use a watering can with certain design features can help you decide which device to purchase. The two most basic kinds of watering cans are either metal or plastic. Plastic tends to be a bit less expensive and is generally not that durable but these watering cans are lightweight and easy to tote. Metal cans last longer, provided they are galvanized and resist rust. These may be a bit heavier to haul around but their durability means you can have your trusty watering can around for the life of your garden. There is no right or wrong choice but one thing to consider is off gassing. Plastic cans can contaminate your water, which is something to regard if you are watering edibles. Otherwise, either of these watering cans for gardens should do an equally good job. Size is another issue. If you are using watering cans for light duty work, like gently watering under the leaves of an African Violet, you need a little guy. For bigger jobs in the greenhouse or garden, choose one that you can comfortably lift but that keeps you from having to make frequent trips to the hose bib. It may seem odd to worry about the length and size of a watering neck but consider the different types of plants you will be irrigating. In the case of the African Violets, for example, a longer, slender neck is best to help you get under the leaves. Longer necks are also useful for hanging baskets and other hard to reach locations. Shorter necks are sufficient for most overhead watering and offer stability without much dribbling. The position of the handle may be something to consider too. Hold the can and see if it is comfortable to pour. Different types of watering cans will handle in distinctive ways. A double handled model may be useful for older gardeners or children who can stabilize the can effortlessly with both hands. It is important to know what type of plants and situations you will be using the can so you can determine which specifications meet your needs. As they say, “a rose is not just a rose.” The sprinkler attachment, often called a rose or rosette, is one of the more important features of the watering can. If you don’t have an adjustable spray rosette, you need to know when to use a watering can with specific spray spouts. Some watering cans for gardens have a fine spray which delivers water gently. These are useful for delicate plants and newly sprouted specimens. The rose at the end of the spout should remove so you can also deliver fast doses of water. This is also helpful if the spout clogs, so it can be cleaned. Adjustable rosettes are a wonder. You can give a gentle rain shower or a more vehement watering, but the rosette spreads the water over the surface of the soil evenly, getting to all the roots. Using watering cans in different ways may mean keeping around a smaller, long nozzled one and a larger capacity, ergonomic type with adjustable rose. That way you have covered your bases and have a can suitable for any type of need.